People have been eating at tables for thousands of years, but setting the table, the way we think about it today, is a more recent concept. In the Middle Ages, at the dining tables of the aristocracy, all of the dishes were typically laid out on the table at once. Things were done this way so that the hosts could show off how much food and drink they were able to provide. This practice, known as service à la française, or some variation of it, held up for quite a while. Toward the end of the 1700s, however, practices began to change, and more aristocrats began using service à la russe, in which food is served to guests individually, course by course. All of a sudden, there was a lot more space on the table. Thus, modern table settings were invented as a way to provide a feast for the eyes as well as the stomach. Much like in earlier days, the quality of the centerpieces, plates, and cutlery that became popular after the change in dominant service style still served as a way for hosts, whether in restaurants or private homes, to show off their status. Today, many people take table setting seriously, not just the elite. People pride themselves on impressive table settings for holidays, parties, and all sorts of occasions. Some people even participate in tablescape competitions! 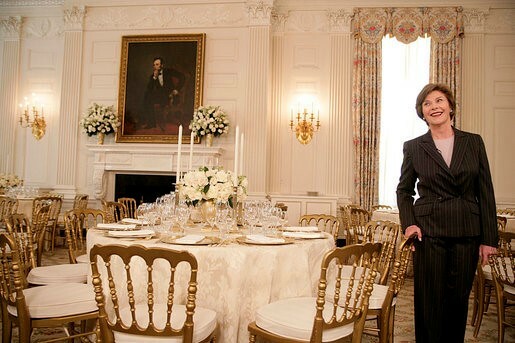 Former First Lady Laura Bush, next to an ornate table setting in the White House for a 2007 State Dinner in honor of Queen Elizabeth’s visit to the U.S.